The project Chingona Por Vida investigates the shortcomings of visual perception and the complexity of intersectional Latinx and queer identities. Via photography, video, and installation, and through the lens of the central subject, Chingona, the project mines personal and familial histories of migration and assimilation as one family migrates from Mexico to the United States. Personal struggle for cultural recognition is explored alongside the complex and fraught history of the annexation of Mexico and its impact on geopolitics and individuals’ lives. Overlaying personal narrative, the treaty of Guadalupe Hidalgo and the current geopolitical situation of U.S. and Mexico border relations and immigration policies, the project seeks to both humanize and complicate the cultural understanding and perception of what it means to be Mexican American and queer Latinx today. Overlaying personal narrative, the treaty of Guadalupe Hidalgo and the current geopolitical situation of U.S. and Mexico border relations and immigration policies, the project seeks to both humanize and complicate the cultural understanding and perception of what it means to be Mexican American and queer Latinx today. Taking on the aesthetics of natural history museums the points of interest on the maps reflect points of personal and familiar import along with the history of the annexation of Mexico. The treaty of Guadalupe Hidalgo. With the defeat of its army and the fall of the capital, in 1848 Mexico entered into negotiations to end the Mexican-American War (1846-48). February 2, 1848 the Treaty of Guadalupe Hidalgo was signed between the U.S. and Mexico, ending the war and forcing Mexico to give the U.S. 55% of its land. Mexico relinquished the territories of Alta California and Santa Fe de Nuevo Mexico – which are now the U.S. States of California, New Mexico, Utah, Colorado, Arizona and Texas. This unfair treaty paved the way for the national oppression of Chicano people in what had been the top half of Mexico and is now the Southwestern United States. Site specific, multi-media installation, exploring the intersectional border space of queer and Latinx community, inserting an expansive space of queer utopia and Latinx cultural worship into the physical space of the gallery. Part of a series of installations. These alter installations take into account Mexican and LatinX traditions while also cross-pollinating said traditions with queer and trans histories, aesthetics and practices. Recalling members of the queer community we have lost and celebrating them while also demonstrating an intersectional queer utopian impulse toward remembering our ancestors while fighting for the future. Dia de Los Muertos is a multi-day holiday, celebrated in early November throughout LatinX cultures especially in Mexico, where it originated. It draws on indigenous Mexican traditions and is observed throughout the world particularly by people of Mexican ancestry. Di de Los Muertos celebrates the lives of the deceased with food, drink, parties, and activities the dead enjoyed in life. Alters are a typical cultural form of recognition of the dead during this holiday. 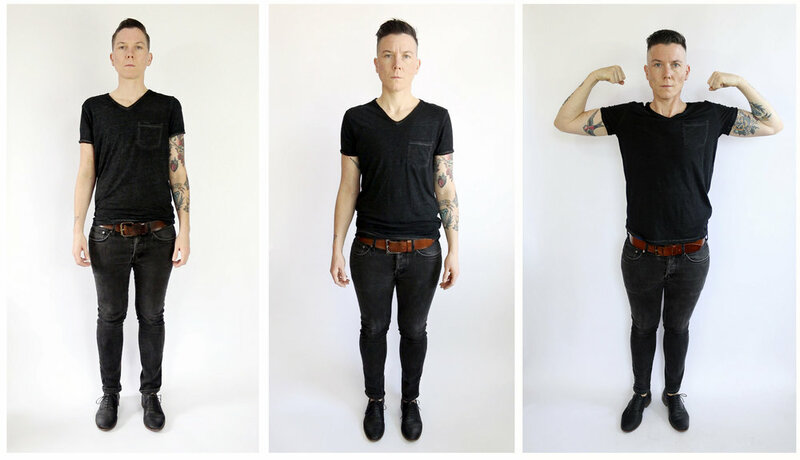 The series, Gender is a Drag, a photo and video based work that explores and expands the space of non-binary gender. These photograph are part of a body of work comprised of videos and stills documenting the transformations I undergo due to taking hormones. There are also videos in which I discuss various topics related to gender in general, gender theory, my own experience and concepts that I am researching in conjunction with this work. Being white, able-bodied and often viewed as masculine, allows me to remain relatively safe as a non-binary person. I am in a position where I can use my privilege to make more space for non-binary and gender non-conforming people. From an ongoing body of work investigating addiction, dysfunction, familial relations and the struggle of working class Americans. From a series of portraits of trans and queer subjects. Hyperqueereality exists on the wrong side of the proverbial tracks and is uninterested in moving toward the center of dominant culture. Instead Hyperqueereality like hooks’ writing invites the viewer away from the center and into the landscape of marginality. This particular landscape of marginality exists somewhere between narcissistic fantasy and lived queer reality, perhaps utopia and/or perhaps dystopia. Its characters exist some times as superheroes and other times as antiheros, but ultimately as pluralistic protagonists. By enticing the viewer into an alternate reality where queers are the koolist kids on the block and queer reality is the mode of existence Hyperqueereality compels us to identify with the possibility of redefinition and the reexamination of how we view, conceptualize and negotiate not only this specific body of photographic work but the ways in which we negotiate the world we inhabit. I would rather be with her than anywhere else in the world. I want to protect her from everything past present and future. She means more to me than I can ever explain to you, so much that I am compelled to try. Love Ethic is an on going project about my partner, Libby. It is a portrait of her through my queer/trans/non-binary gaze and it is an exploration in making pictures from the place of a love ethic.